Bullies demonstrate themselves in many forms, not always limited to the pimple faced somewhat overweight boy, large in stature for no other reason then the fact that at least once being held back in the early stages of his education experience, gave him the illusion that he was actually bigger then others. Lacking as much in the cute existential comment department as they do in compassion, but always present the heart that drives them to particular behaviors of cruelty perpetrated against weaker defenseless opponents bullies resent often times for reasons known only to their own jealous desires. The first either, “Turn and Run”. Turning represents a physical changing direction from the path in which one has been set. When a person turns their back on something, it becomes difficult, if not impossible, to see it, thus the person becomes blind to everything that lies down that particular path they were on only moments before. Turning ones back on the attacker puts them in a particularly vulnerable position, by presenting one’s back, inviting attack without defense, blind to any blows, tail tucked in pathetic attempt to protect private parts in the backside of running retreat. Protecting private parts, now that’s a statement; trying in some desperate way to protect a person’s destiny, their not yet conceived future, even maybe their children, holding tightly to a hope that not only pain will be avoided, but maybe another daybreaks warmth still might be found shining on their face, if only through survival. “Turning and Running” demonstrates and grants most assured defeat! But let us make one thing clear, we are talking about a bully here, not standing and fighting battles we are not equipped, nor called to to fight against in our proper time, by Him who would command us. Running, and while in certain undeniable and overpowering attacks, survival can in it self finds certain qualities of victory, but for the sake of the bullying, we can assume that God will never place His children who seek Him in a place where defeat is possible. Notice He says “seek ye first”, so by assumption, if we are seeking first, doing what we are supposed to, in each and every one of our steps, then we can also assume, by His promise, that He will give us all we need to overcome any challenge, any attack that presents itself on this path. But God also doesn’t honor the footsteps of fools. If we by our own selfish desires and sin find ourselves not only off the path, but knee deep in the camp of the enemy, then getting everything we need to overcome, may just reside in a pair of good legs and enough oxygen in the blood, to get us out of there with barely our skin. Back to the bully; running is defeat, and results in two things that only a good God could even remotely turn to positive; it reduces the value, the stature, of our would be hero in the eyes of most watching, those eyes of himself being the greatest effected. Popular phrases that one will often hear include; “Once a coward always a coward”, “You chicken”, or “Scattering of the roaches” these just being a few terms, that have been associated with people who flee. Gods ability to even turn this into positive is without dispute, for no other reason then just because He said so, but we will have to reserve this topic for a future writing. The second effect of running, is that it builds the confidence of said bully. Making it more likely he will just do his mouthing-off again, louder next time, more often, and cause even more damage in the direct vicinity. So confident is the bully of where he has been that he doesn’t even look back. And why should he, only the conquered reside behind him? But it is in his confidence that he exposes his weakness. There is a second choice, “Stand and fight”. “Standing and Fighting” grants and demonstrates certain victorious parts! Victory is victory! By definition first a person must stand; get up, rise, now with this image carries a meaning of an immediate and direct increase in stature. When a person rises to the occasion, they grow larger, and in direct counter, their opponent will decrease, if by no other means then just simple vantage point. As a person being attacked gets higher, the object against which one stands appears smaller. To stand also implies to find firm foundation, one can only successfully achieve firm foundation if they press against something also firm, rock being the strongest, but make no mistake even a deep foundation in sand, the key being deep, can be a significant pillar for resistance. God describes studying the Word as finding deep foundation or building on the rock, both apply. As I have already stated the physical changes that one will benefit from in standing and fighting, those being first an increase of the defender, and a decrease of the attacker. These are immediate and Godly provisions given by the natural laws that nobody can deny. There is movement and that movement is backward into a realm the giant never looks, he has no experience there. But let us examine further some supernatural effects, those under the skin. What must have gone through Goliath’s mind, and maybe even that dark hole which represent’s his heart, when David walked out there unto the battle plane? And we might even possibly take a glance at what may have been going on supernaturally, in and around the environment. First, In Goliath’s experience everyone who had ever faced him ran, only the poor unfortunate’s that he may have been chased down, fought back in some kind of pathetic defense as he dished out his cruel blows. For an oversized opponent, forward motion has it’s advantages. Forward momentum of any type is a force that must be resisted, held in check, overcome, and eventually overpowered in order to turn into a retreating posture. Very difficult situation when facing something that big, no maybe the largest warrior to ever step up. So when Goliath saw someone step up and faced him, even just a boy moving towards him rather then away, most likely doubt from witnessing something new and yet unseen must have at least tickled the edges of his senses. It wasn’t tickling the hordes in the supernatural, for the wave of force that shot through their ranks most assuredly shook them to their black bones. He was bigger then anyone, so fighting from a hight advantage in downward blows, allowed him to engage much stronger muscle groups then having to fight upward. Goliath was used to only forward motion, using his imposing size, weight, and great strength to do most of his work for him. When David stood, the increased advantage, even if it had been but a slight decreasing effect on Goliath, was a decrease none the less! Anyone who participates in any kind of top sport activity will tell you momentum is a powerful thing, and when someone starts downward, or decreasing in trend, that it is usually coupled with some kind loss and or pain. Next David not only took Goliath’s insults and threats, but laughed at them and responded with his own, backed by the power of the Creator of the Universe! Ooops! Suddenly Goliath’s words that usually made his opponents quiver made this person laugh, but notice Goliath wasn’t laughing, he was to busy shaking from the Lion’s roar he just heard! Something was seriously wrong here for Goliath and for the first time in his life he might have even felt that cold chill go up his spine, and if he wasn’t, he should have been! Momentum shifting, from Goliath moving forward his whole life, to being suddenly held in check, someone stepping up, him shrinking in stature, and getting less then expected result from his threats, even resulting in further diminishing on the bullies part. Momentum had shifted! Goliath threw out a desperate comment, trying to weaken David with statements of; “You come at me like a dog, with a stick.” His comment was not as much of an joke, but a feeble attack, for it was designed to make David believe he is ill equipped to the task. But David’s faith and the trust he had everything he would need from God to defeat this man, threw the insult right back stating that Goliath’s weapons were nothing compared to that of the Living God. And if Goliath’s eyes weren’t wide with fear at the power of these words, they where the moment the giant took but a single step forward and David started running straight towards him! At every turn victory was accomplished, and the actual deliverance had not even been dealt out yet. In everyones eyes, natural and in the supernatural, there was no doubt as to the sudden cease and immediate reversal of the momentum. I can imagine on the barren plane of the supernatural where a horde of demonic legions stood moving comfortably forward against the children of God, riding on the backside of Goliath’s image, the attack’s and effect’s of the constant bombardment of fear, doubt, hopelessness, rejection, abandonment, and doom, must have been nearly overpowering to the soldiers of God’s army. Many a troop probably were gripped in such paralyzing oppression, that they were to busy protecting their soft underbellies in some kind of fetal self comfort, to even pick up the sword and shield that lied only a hands reach from them. I can hardly imagine the refreshing warmth that must have flowed over them like anointing oil as the demon horde immediately stopped the attack, withdrawing into their own defensive positioning at the sign of the sudden and direct momentum shift exploding in front of them like a nuclear explosion of bright holy light! Thousands of smaller demons squealed and ran almost immediately as the light went on! “A Scattering of the Roaches” does apply here very nicely! There must have also been an immediate withdrawing of the more herd animal type troops, first pulling back hard and then interlocking the shields in some kind of desperate counter defensive. This had no doubt, sent that physical twinge up the spine of not only Goliath, but all of the Philistine troops assembled, cold and lonely was it’s chill. A direct opposite the counter anointing, the refreshing warmth that thrusted power and confidence into the souls and bodies of the Israeli army. But I also know when David charged, any demons of herd animal status, the entire front lines, dropped everything and ran, even trampling those who were not as fortunate to get out of the way. That’s what herd animals do when someone charges. Ripples of fear and fiery Godly retribution sent choking shivers through the remaining demonic soldiers, and this feeling was backed by the power and presence of the God who created the universe. The Stone, the hurdling of the rock, the spoken manifestation, the small representation of the word of God, even in it’s simplest form, was all it took to open the floodgates of Gods deliverance. David could have thrown anything, the giant was already doomed, but throwing out a single small piece of the Word was all it took. Once contact was made result was immediate and sealed. Down onto his face Goliath fell, back exposed, demons of all ranks were running for their live’s, very much emulated in the natural as the armies of the Philistine who also broke and ran. At this point all that remained was the mopping up! David casually walks up and takes Goliath’s head, his victory prize to present to the king. The armies of the Living God pursue now in frenzied strength, I am sure empowered by the angelic horde that wraps themselves in and around all of the arms and souls of the Lord’s army until all of the opposing force has been hunted down and killed. The Bible speaks of bodies being scattered across the country side. It took a little time, and effort, but victory was granted before long before the army was destroyed. A woman sits comfortably in her home, a child of the Living God, she closes her eyes in quiet contemplation of the path that God has placed her two beautiful feet on. As she strides up the path, eyes focused on the radiating light shining out from the destination her soul draws to, led in quiet solitude by the spirit that grows within in each and every step, she is only just beginning to feel the pestering pull of the voices on the few strings that remain within her house. On a hill a horde is forming, gathered to distract even if only her eye from task. They are not trying to pull her from the path, that is not their job, but they do belong to the army of he who feels he can, given the right positioning, preparation, and infiltration. But for now the task at hand is distraction, keep the door open, keep that earthly ash blowing into her house if, for no other reasons then to dirty up the corners. God gives her this day a vision, and in this vision she sees, no maybe just feels, the spirit that rests within cigarettes, it is a worm! It startles her, and she throws the cigarette down, almost an immediate reaction to discovering the creature. Worms, foul creatures that sneak in the most indiscriminate way, finding access inside the temple, then uses it’s own hunger and greed to burrow inside feeding on the blessings of God, unknown, hidden, until it has done so much damage that rot and sickness is assured. But in the vision also she throws it down!!! Momentum! “Wait!” she says, she pleads for council, help, she turns to God….She walks up to the battle field, she stands! This time she stands. She has someone with her, another trying to help her, encourage her… endear her with courage! One of the commanders among the demonic horde screams with the top of his dirty longs; “How dare anyone tell me I shouldn’t smoke!” “It’s my right!” The voice is a confident one, a giant, a veteran of many battles. Anger presses from its words, if only by their forward momentum, insult follows, feelings of insufficiency, inadequacy, doubt drips like black blood off the spear tips of a “right to do what I want”. But the resistance this time is met with a different power, the power of love and light; she stands, firm in the word, deep in its foundation, and dead in their tracks the front lines of the demon horde stops almost causing the lines to crash into itself! They take up defensive position. Their insult’s and attack’s do some hit home, doubt’s and fear’s find open window’s in the house, chink’s in the armor but the posture of the woman continues to stand further and further erect. The fear and chill ripples through the attacking group now frozen in fear, they even try to take cautious and unbelieved steps backward if just to find their own firm footing, but they have none but muck and mud. Her words; “I want this to be gone from me”, “I don’t want this in my life any more”, “help me”, send out their own volleys of the word, the difference her’s is backed with the power of a living God, speaking of a child calling to a Father for help. She is tired, she is a child, voicing if only calls of pain and weakness in standing alone; “I’ve tried and always failed in the past”, but these are also call’s to the Father for His help. And she actually starts running at them!! She moves towards them in a real and physical attack of her own, she go’s to get an unused cigarette to “throw it down”. For as she saw in the vision, she is about to duplicate in the real physical. “Pick up your matt and walk!” How must that have sounded to the man who was crippled his whole life. For just a moment, do you think something dark may have whispered into his ear; “What is he crazy, you can’t, you tried so many times”?Maybe he even reached up for help, but God gave him all he needed to overcome, and he stood? The continuing of believing, that is called work. On the barren plain, fear of the pure power of the Living God exploded through the demonic horde as fast as a blast of irradiated light of the greatest flash ever witnessed. The front line buckles and explodes in a moment. From a barrier and confidence that has been no doubt built over years, toppled in a moment. As the demonic troop scatters, a wall of dark black brick is clearly seen, most likely that of which these creatures have been leaning against, hiding, almost secretly building inside the courtyard of God’s beautiful child for years. The ripple of the power sends a shock wave through the ground like a massive earthquake wave right into the enemies camp, and like a vast wave rolling through a calm still black lake, so confident they were in their hold and position there wasn’t even a ripple on their surface of their darks waters, until now. As the wave explodes through the dark waters, it becomes clear and sure to see, not deep were their murky secrets, an illusion of lies and discrete. The wave gathers strength as it approaches the wall, it seems to be powered by her momentum, and that of the Word, exploding into the dark wall sending it toppling like a flimsy card house of black dominoes. 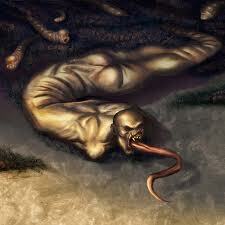 The worm faced giant lay face down in the muck, back exposed waiting only for deaths victory to be dealt out. She stamps them mercilessly into the ground, for they showed her no mercy as they tried to steal her gifts. Time to mop up! She stamps the cigarettes into the ground in defiance. Yes there are groups of fleeing troops that have run to the trees, waiting for some reinforcements for small counter attacks. Waiting for orders, they still turn and fling arrows of doubt. Tossing accusations against those who helped her, doubt, challenges to her to turn and run, more doubt, calling to her “if you doubt any you must doubt all”, trying to shake even her faith that God could or would help her, more doubt, but her shield is up and deflection is becoming something she is beginning to master. One by one each of these little attacks fall, time, distance, and perseverance must follow to mop up the entire army. Victory is undeniable! The stronghold has been toppled! Now the mess has to be cleaned up, many dirty bricks lay around, held together with the mortar of ash. The black ash water is just settling, the clear water pressing the ash into the soil soon to become the fertilizer of another beautiful patch of garden. Her house, her lands are called to be a garden, not a barren plain of ash. Yes there will be skirmishes, troops will attack, some she may lose, but many she will win, and ever will their numbers slowly dissipate until the last of the retreating horde finds itself defeated or banished.